Chicago - Chicago... As Old Blue Eyes sang - It's My Kind Of Town. 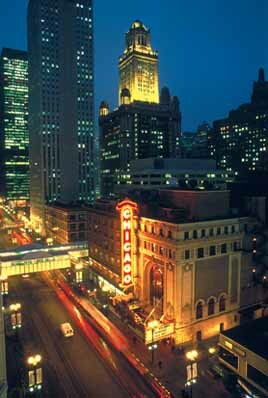 Chicago is located along the southwest shore of Lake Michigan and is in a region of frequently changeable weather. The title "Windy City" was given to Chicago by New York Sun editor Charles Dana in 1893. He was referring to listening two long-winded politicians boast about the wonders of the World's Columbian Exposition held in Chicago that year. Not only is Chicago's history colorful, dynamic and ever progressive... no better place is there to spend today's vacation. has as many. To name a few - Chicago produced the first steel frame skyscraper, stainless steel building, electric iron, cooking range, Pullman railroad car, grain reaper, reactor to produce electricity from atomic energy, cafeteria, w indow envelope, the bifocal contact lens, the winding watch, the Butterfinger and Baby Ruth candy bars, Cracker Jacks, Schwinn bicycles and the list goes on. Place is the largest convention center in North America. And then there is Chicago's Magnificent Mile. The downtown area has been updated and renovated to meet with today's demands. There is no finer and/or diverse shopping than in Chicago and its surrounding suburban malls: Saks Fifth Avenue, Marshall Fields, Lazarus, Bloomingdales... and the boutiques are diversified. When it comes to continental dining there is no match to what Chicago has to offer. From casual inexpensive to the finest formal cuisine in the western hemisphere. 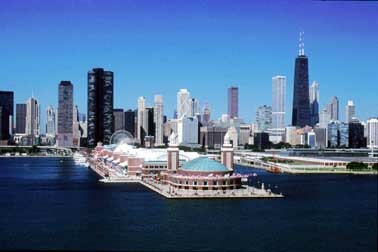 mention: Chicago has 46 museums, more than 200 theaters, approximately 7,000 restaurants, three of the world's tallest buildings, 29 miles of lakefront, 15 miles of bathing beaches and the world's largest cookie and cracker factory, where Nabisco made over 4.6 billion Oreo cookies in 1997.